The importance, magnitude and impact of the birth of the West Clare Railway on the local transport system of County Clare cannot be measured. The story has been well documented over the years, in book and song. However, it is extraordinary that it was not until the mid 1990’s that a local committee attempted to revive this treasured historical railway. Jackie Whelan became involved when a committee for the Restoration of the West Clare Railway was created in the mid 1990’s. He initially carried out all the preparatory works for the tracks of this railway line, including all excavation works, track laying & fencing on a voluntary basis for this committee. 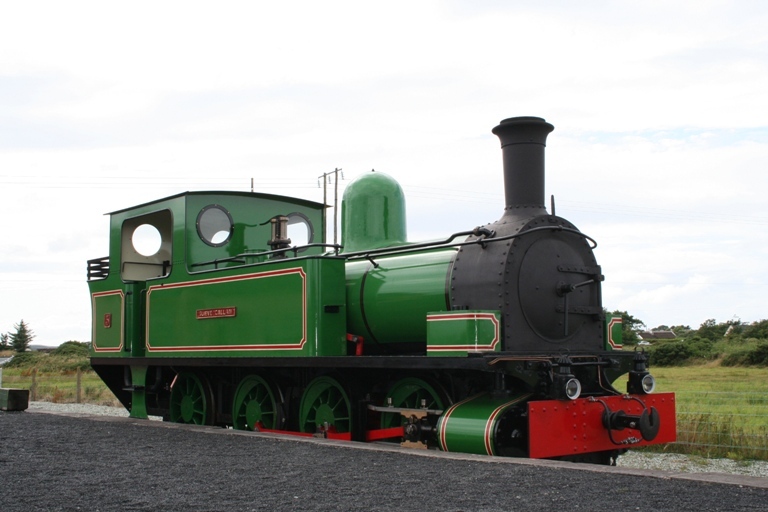 One objective of the committee was to include the “Slieve Callan” steam engine as part of the proposed West Clare Railway restoration project. At that time this steam engine lay dormant and on display at Ennis Railway Station. This project presented an excellent opportunity to preserve and restore this unique locomotive. A proposal was made to C.I.E. to remove the engine from its plinth in Ennis. For any proposal to be considered it required proving a commitment to the West Clare Railway restoration, and this was obvious by the substantial preparatory work carried out in Moyasta. An agreement for the removal of the “Slieve Callan” steam engine from Ennis to Moyasta was granted to the West Clare Railway company, amid much consternation in Ennis at the time. Unsurprisingly, the agreement had conditions, including that the engine be substantially improved or rebuilt within 3 years. This would require enormous funding. At this stage the committee involvement ceased. Jackie then became directly responsible for carrying forward and persevering with raising funds to continually update and improve this unique venture to bring to where it is today. In 2009 the “Slieve Callan” returned, rebuilt and running smoothly, to Moyasta Junction. It now provides visitors and enthusiasts alike with a look into, and experience of, the fascinating railway history of Ireland, and is a fitting tribute to our heritage and to the hard work and efforts of all involved in bringing a steam locomotive back to Moyasta. For more details click “A Short History” on the left column.